- Schistosomiasis: a neglected tropical disease (NTD) associated with poverty, a lack of clean water and sanitation, caused by the Schistosoma parasite affecting more than 240 million people a year. - Mass drug administration (MDA) to control disease costs ~$100 million annually. - In Senegal, WHO estimates MDA coverage of the at-risk population <10%. aquatic vegetation decreased the prevalence of schistosomiasis in nearby villages. - To isolate unique spectral signatures of environmental parameters known to support the freshwater snail vectors of schistosomiasis to interpolate in the future. - This will enable targeting potential water access points for vegetation removal to supplement MDA programs to improve schistosomiasis control in Northern Senegal. - First step: determine environmental parameters that are significantly associated with presence of snail vectors to identify imagery aspects of significance. - Data collected from water access points in villages in Saint-Louis region of northern Senegal along the Senegal River and Lac de Guiers (June-August 2017). - Number of snails by species and vegetation recorded for each sweep of net. - Data analyzed through logistic regression models to determine whether the presence of certain types of vegetation were significantly associated with the presence of snails. - NDVI scores for geo-referenced vegetation locations were calculated and comparison of means was conducted (student t-test) in SAS 9.4 (Cary, NC) to determine difference between the NDVI scores of vegetation habitat areas with and without snails. - Literature indicates certain types of vegetation significantly associated with snail presence – this held true in northern Senegal data. - Ceratophyllum was the most significant predictor of snail presence among lake and river water access sites, followed by Ludwigia. - Visible and NIR proxy biosignature scores of three vegetation types present in water access points with and without snail habitats did not indicate significantly different NDVI scores, but did provide direction on future analyses using NDVI measures. - The methods proposed here serve as a targeted approach to supplementing and strengthening existing control efforts in communities already overburdened by NTDs. Ceratophyllum was identified as a strong environmental parameter associated with snails. - Next steps: to investigate the environmental characteristics at the site level, including vegetation, water quality, topography, and surrounding land use land cover by comparing drone imagery collected at the same time the satellite imagery was obtained to determine what imagery components best represent the environmental parameters of interest. - By identifying significant environmental parameters, moving forward we will determine the unique sub-pixel makeup of the image at the locations of the parameters of interest. - These signatures will be locally validated among known sites before field validation in previously untested areas in northern Senegal, which will occur this summer. 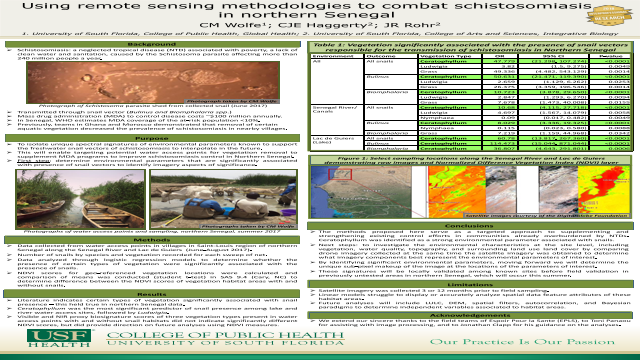 - Satellite imagery was collected 3 or 12 months prior to field sampling. - Linear models struggle to display or accurately analyze spatial data feature attributes of these habitat areas. - Future analyses will include LULC, DEM, spatial filters, autocorrelation, and Bayesian paradigms to determine independent variables associated to habitat areas. 2. Adenowo AF, Oyinloye BE, Ogunyinka BI, Kappo AP. Impact of human schistosomiasis in sub-Saharan Africa. The Brazilian Journal of Infectious Diseases 2015;19(2):196-205. https://doi.org/10.1016/j.bjid.2014.11.004. 3. World Health Organization. Media Centre - Schistosomiasis Fact Sheet. October 2017. Accessed 2 November 2017. http://www.who.int/mediacentre/factsheets/fs115/en/. 4. Sokolow SH, Huttinger E, Jouanard N, et al. Reduced transmission of human schistosomiasis after restoration of a native river prawn that preys on the snail intermediate host. Proc Natl Acad Sci U S A. 2015;112(31):9650-9655.